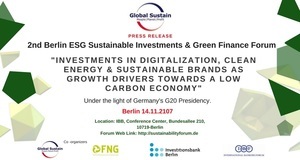 Topic: "Investments in Digitalization, Clean Energy & Sustainable Brands as Growth Drivers towards a Low Carbon Economy"
After our successful forum in 2016 with same reputable co - organizing partners (FNG, IBB, IBF) as well as sponsors, media partners & senior speakers from investment funds, multinationals, banks, finance service providers and media we would like to raise your attention about our upcoming, 2nd Berlin ESG Investments & Green Finance Forum 2017 this year on 14.11.2017 in cooperation again with our reputable sustainable forum co - organizing partners (FNG, IBB, IBF) as per last year, having already the confirmed support of more and new partners this years. Featured media partner will be Thomson Reuters. We have already confirmed senior executives and managers as speakers from S&P Trucost, Thomson Reuters, IBB, FNG, IBF & many more. We would like to raise your attention about the speaking & partner opportunity. Staying at your disposal.